Michael Thompson, Ph.D., is a clinical psychologist, lecturer, consultant and former seventh grade teacher. He conducts workshops on the development of boys and social cruelty in childhood for both public and private schools across the United States. He is the author of Speaking of Boys and coauthor, with Dan Kindlon, Ph.D., of The New York Times bestseller Raising Cain. The father of a daughter and a son, he and his wife observe children’s friendships from their home in Arlington, Massachusetts. Catherine O’Neill Grace, a writer and editor, is a former elementary, middle, and high school teacher, and was the editor of Independent School magazine. She wrote a column for young readers about health and psychology in The Washington Post for fifteen years, and is the author of numerous nonfiction books for children. She and her husband, a headmaster, live on the campus of a boarding school near Boston. "The stories in this book come from many perspectives — those of therapists, educators, and parents. The wise, kind authors give us a fresh cogent analysis of this critically important issue. 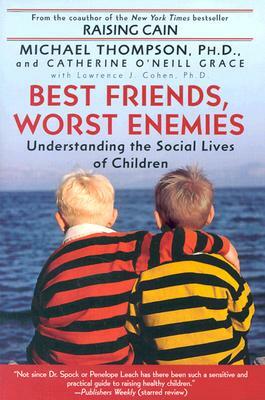 I recommend BEST FRIENDS, WORST ENEMIES to all those who work with and love kids."